With the upcoming holiday weekend, I couldn't help but preemptively get into the holiday spirit. I mean, you know me. I'll never miss a chance to start celebrating something early and then keep that party going for as long as possible. Month long birthdays anyone?! White tees and denim are about as good a combo as black and white. They'll never go out of style and pretty much never look bad (ya know, unless, like you spill bbq sauce all down the front of that white tee...then you might maybe sorta look bad). 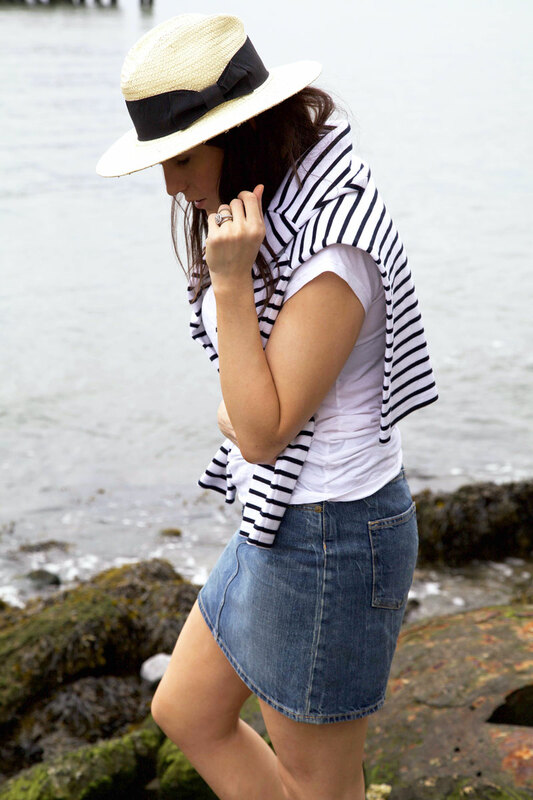 I wear my white tee and denim skirt frequently throughout the warmer months, but for a little twist to get me in the holiday weekend spirit, I decided to throw my striped shirt over my shoulders. Groundbreaking stuff, I tell ya. I mean, who would have thought, let's throw a long sleeve short over a short sleeve short?! Someone who clearly needs to go shopping, that's who. Do you guys have anything planned for MDW?